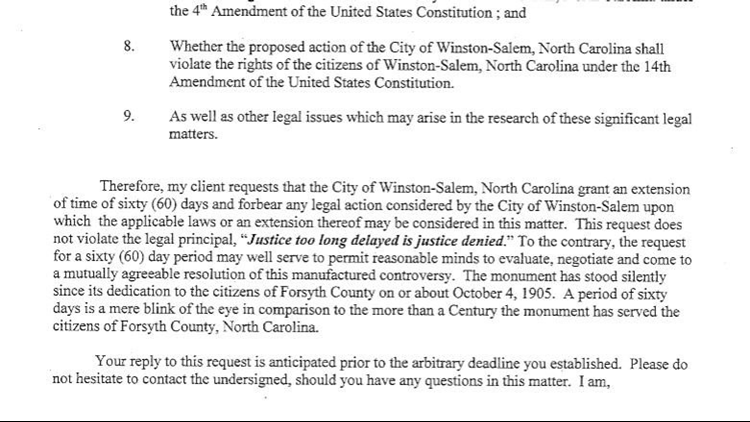 In a letter, The United Daughters of the Confederacy asked the Winston-Salem City Attorney for a 60-day extension. WINSTON-SALEM, N.C. — Editor's Note: A previous version of this story stated the statue would come down Thursday, Jan. 31. Mayor Joines clarified the timeframe in a conversation with WFMY News 2 on Wednesday. 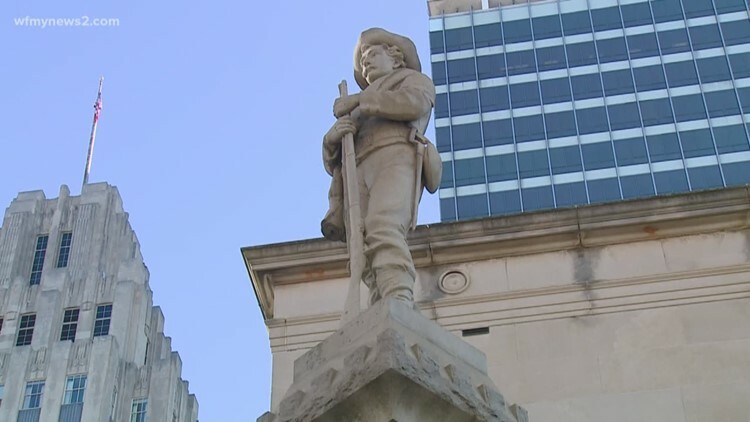 The deadline to remove the Confederate monument in downtown Winston-Salem is quickly approaching. The City has ordered it to be taken down by January 31 and moved to Salem Cemetery, citing public safety concerns. 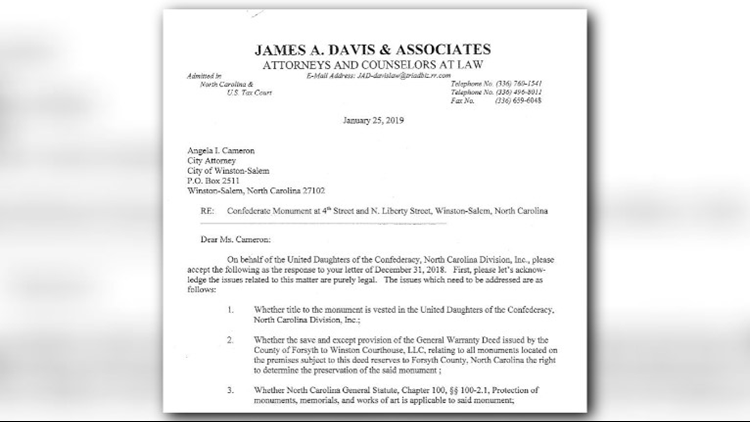 In a letter, the lawyer who represents, The United Daughters of the Confederacy (UDC) asked the Winston-Salem City Attorney for a 60-day extension. As of Tuesday night, the request has officially been denied according to Mayor Allen Joines. Mayor Joines said following the letter's submission on January 25, the owners of the land the monument sits on were considering the extension but have decided otherwise. The statue will still be coming down 'in the near future' despite the legal efforts of the letter that addressed nine legal issues. Up until this point, the UDC has claimed ownership of the monument. But the document states the group needs more time to figure out "whether title to the monument is vested in the United Daughters of the Confederacy." "I will be happy to provide you with a copy of the city’s response to the Davis letter, when the same is ready for dissemination."